Been a while since I went fishing. Boss has been breathing down my neck and have been covering my colleagues for the past month ‘cos everyone except me is on leave. Other kakis on the boat were also landing fishes. 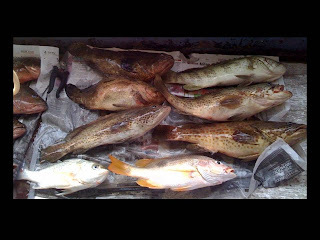 Within the first two hours, landed 9 pieces of MJ and 1 piece of grouper. Then it quieten down. Moved to a couple of other spots, all quiet. Then came lunch time. I had my lunch early and was the only 1 fishing when everyone else was eating… Cast out far again and got a small bite… Landed a small Leng Chiam of around 800gms. Then it was all quiet again…. All afternoon bite was slow and hardly anything decent landed. Nearing tide change at 4pm. Ah Chong brought us back to the first spot in the morning. Lots of boats parked there… Ah Long who has been following Ah Chong the whole day, trailed us to the spot as well. Doesn’t he has his own spots?!!?!?!?!? Anyway back to the fishing. Its not as fast as the morning but we were landing some good sized grouper. All 1kg and more. Thereafter moved to our favourite Tek Nor spot, no bites this time round. Landed some small fishes which were thrown back. Overall an average trip for the boat but a very good trip for myself. 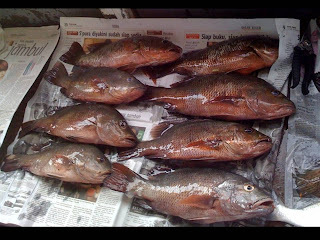 Total catch for me: 3 MJ, 1 grouper (1kg+) and 1 Leng Chiam. Only took the grouper which I am steaming tonight, gave the other fishes away to kakis who din have any fish so that everyone can go back happy. Anyway heading off to Horsburgh tml morning to Raju… Need to keep my fridge empty yah… Will update once I am back! good catch & very lucky. btw could you please register at our new forum n post your cr there. Registered liao leh.. But not many pple post there so post here lor. the forum can contact Bro AA cos china banned blogspot.com liao.